Classic rival game between Jones Lady Tigers vs Lake Highland Prep always good to watch and tonite was no different. Though Lake Highland Prep was missing there leading scorer, senior Tyra Cox who's averaging 18ppg, Lake Highland is still not a team who lays down for anyone. 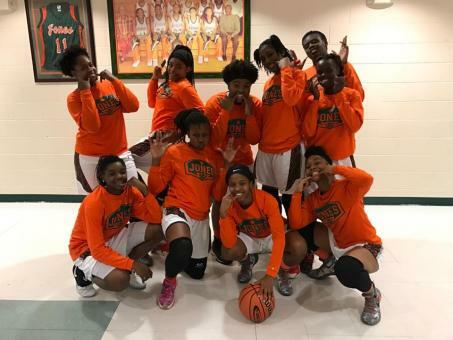 Led by the one of the best coaches in the state Al Honor had his Lady Highlanders ready to play, but came up short in overtime to Robert Moultrie's Lady Tigers. First quarter Lake Highland jumps out on Jones Rollins commit Rachel Jablonski was on fire scoring 10 first quarter points out of there 16 and Chardell Jones turned it on for Jones scoring 9 of there 13 to end the first quarter. Second quarter Jones goes on a 10-0 run ignited by senior Jaiyanna Thomas who was fouled going up for a layup made the basket and knocked down the free throw for a three point play, but the Highlanders would not go away rising junior Jiselle Havas cut into that lead scoring 7pts as Jones outscored the Highlanders 19-13 for a 32-29 halftime lead. Third quarter the highlanders jumped out with a barrage of 3 point shots and aggressive play just appeared more hungry than the lady tigers outscoring them 18-9 in the quarter up 47-41. Fourth quarter to much Chardell Jones of the lady tigers, who scored 8 of her game high 28 of the tigers 13 fourth quarter points including the shot that sent the game into overtime at the buzzer tied at 54. In overtime Jones outscores Lake Highland 8-2 for a 62-56 victory. This was round one of the series if all goes according to plan these two will meet up 3 times and whoever wins that third will most likely be headed to Lakeland to the final 4. Jones is now on a 10 game winning streak.